The easy-casting fluorocarbon that's virtually invisible. 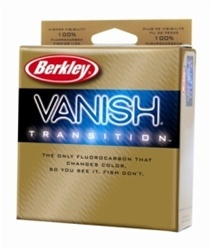 Vanish refracts light similarly to water, making it virtually invisible to fish. The first truly fishable 100 percent fluorocarbon line, improved formula Vanish handles and casts more easily than ever before. It also maintains 100 percent of its knot and line strength when wet. Its higher density makes it sink faster, and the low-stretch formula increases sensitivity and hook setting power.